Making Aamarakhand is one of the simplest Indian desserts. The only tricky part is making the hung yoghurt. It is time-consuming but quite simple. So, if you are going to make this dessert, plan it in advance. While I was preparing to make this dessert, I decided to give this dish a new look. That's when the idea of making a trifle struck my mind. For making it, we need hung yoghurt first and here is how you can make it at home. How to make hung yoghurt? Take a large sieve and line it with a muslin cloth. Pour the normal yoghurt over it and let it drain. You can keep the whole set up in your refrigerator overnight. The yoghurt will reduce to half its original quantity as the whey will drip out of it. If you are in a hurry, you can tie a knot in the muslin cloth and hang it on your kitchen sink tap. The whey will strain out leaving behind nice thick yoghurt. If I were to make normal Aamarakhand, I would have stirred all the ingredients. Here, I went for layering instead. 1. Mix hung yoghurt, sugar, saffron and cardamom to get a smooth flavoured yoghurt. Mix the mango puree and sugar in a separate bowl. 2. In 4 individual short glasses layer the yoghurt mixture and mango purée alternately. Keep the yoghurt mixture as the top layer. 3. Garnish with mango pieces and pistachios. Keep in refrigerator till needed. Serve chilled. 1. You can increase or decrease the quantity depending on the glass size. The one I used was a larger one and served well for two people. 2. You can also add a little cream to the mango puree mixture. a very very good recipe. Wow, an elegant mango delight.. Rocking dish. Anything with mango is always welcome for me. This is an absolutely great way to enjoy Mango as a dessert! 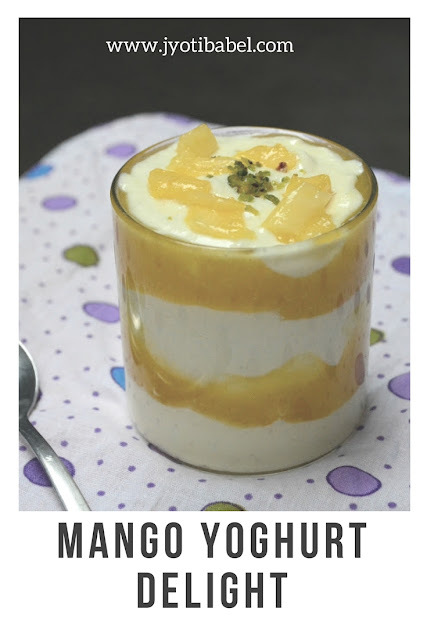 Mango yoghurt delight looks delish. Loved the look. Well presented and an unique way to serve amrakhand. Superb share. 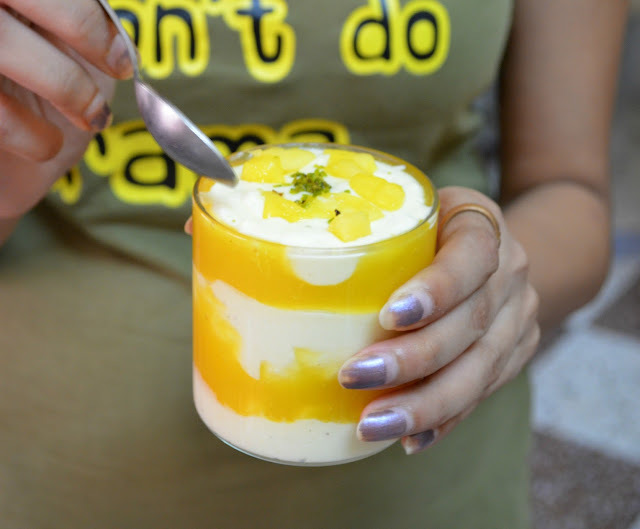 Mango yougurt amarkhand looks so inviting Jyoti and I love the way you served it as parfait layers. This is a easy dessert, I had used only hung curd for the parfait. Looks delicious. Love this creamy mnago delight...simple to make but yummy to enjoy...awesome share!! I love Shrikhand, Amrakhand and all things Mango. 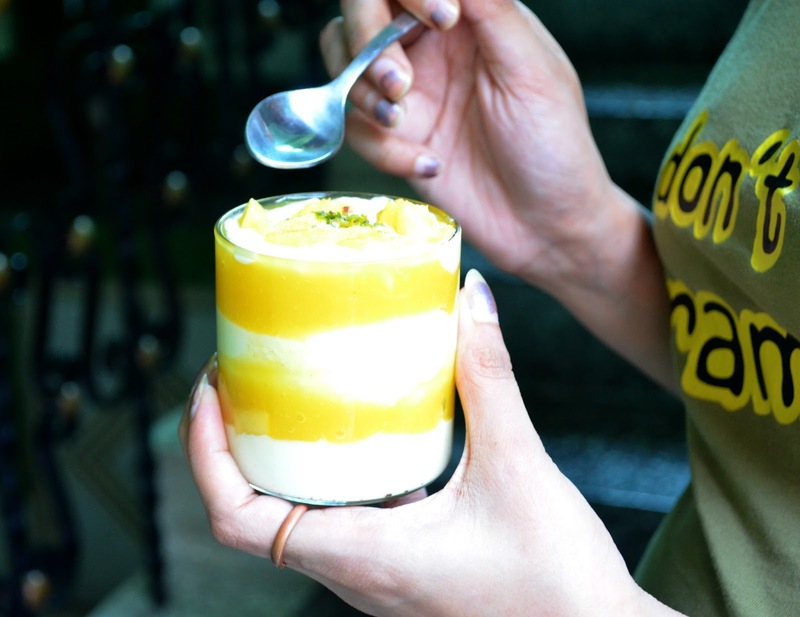 The idea of layering the dessert is amazing, a great party dessert and will always be a huge hit as mangoes are everyones fav. Hope you had a great stay at Mums and your sister is enjoying her time with you. 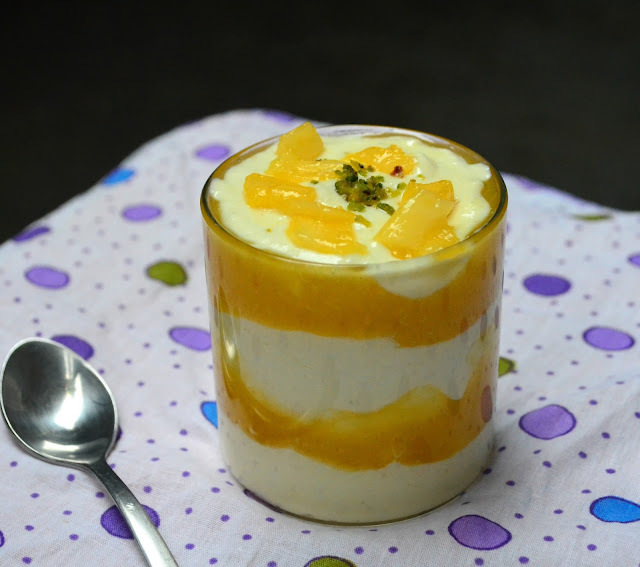 Mango yogurt looks delightful. The layer of white and yellow yogurt looks so delicious. Such a delightful and yummy dessert one can have during summer season. Perfect dish for a party! Such a delicious and yummy dessert. Perfect recipe to beat the heat !